A novelty at Munich 2015. 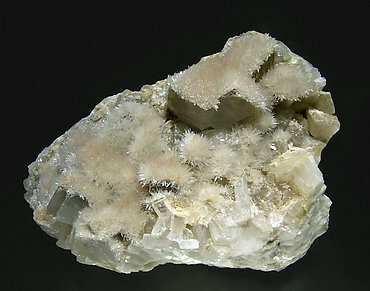 Slightly divergent aggregate of untwined Aragonite crystals. They are transparent, very bright, have a deep honey color and acute terminations. As is usual with Chinese novelties, we cannot provide better locality information. We hope to know more in a short time. A novelty at Munich 2015. 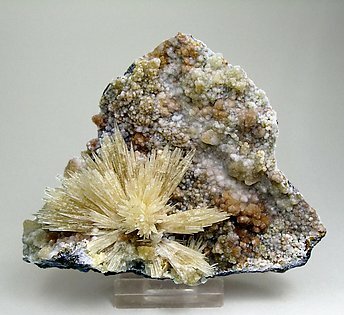 Near parallel aggregate of untwined Aragonite crystals. They are transparent, very bright, have a deep honey color and acute terminations. As is usual with Chinese novelties, we cannot provide better locality information. We hope to know more in a short time. Radial aggregates on matrix of very acute crystals with slightly curved lateral edges. 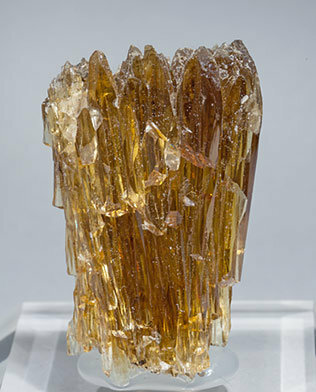 The crystals are transparent, very bright and, unusual for the species, they are untwined. A classic from the Slovak Republic. From a not so well known area at La Pesquera, North of Minglanilla (Cuenca), we present this curious doubly terminated Aragonite specimen that shows on prism faces brownish and violet tones. Probably the most interesting thing are the delicate fibrous terminations on both sides and its good size. For specialized collectors. 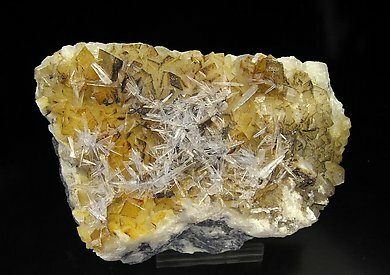 Very acute crystals with very well defined faces and edges, yellow colored and on matrix. Crystals are different and of superior quality to those that are more common at Eugui. Two crossed powerful crystals with some other minor ones attached as well. For its color, luster and esthetics this Aragonite is one of the best quality for this species, famous in Spain as a classic for the country. 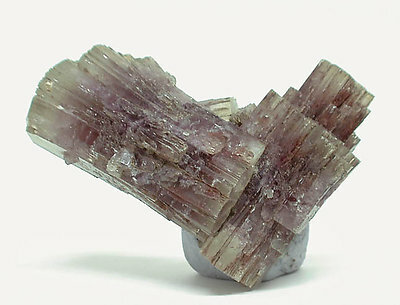 Very aerial and esthetic group of doubly terminated, twinned crystals. They are especially translucent and bright. 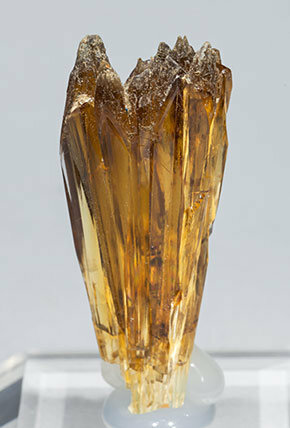 Very sharp crystal with prismatic shape, translucent, a yellowish color and with a very well marked twin on the terminal faces. A classic from the Czech Republic. Coralloid and botryoidal growths with micro-acicular surfaces. The nice blue color is due to copper salts inclusions. We’ll send to the buyer the original label and also a copy of the computer card with the full collection catalog text. 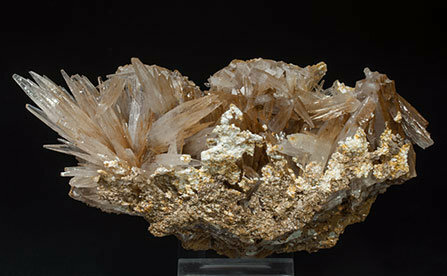 Open group of Tarnowitzite (Lead rich Aragonite variety) from Touissit. As is the case most of the time with Oliete's specimens the esthetics are excellent. Its prismatic crystals have a perfect crystallization, but we call attention on its degree of transparency, very uncommon, on this plumbian variety of Aragonite. It’s also interesting to enhance the contrast with Limonite matrix with little acicular crystals of Malachite. We’ll send a copy of the analysis with the sample. 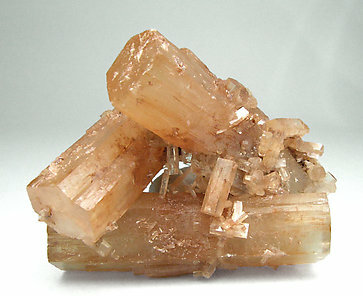 Group of twinned crystals of this rare plumbian variety of Aragonite. They are very well defined and have neat color zonating. They are white on the top and practically uncolored on the prism. They are on a matrix with small crystals of Dolomite. The crystal is a typical pseudohexagonal twin and it is formed by a short prism and the pseudopyramidal termination. 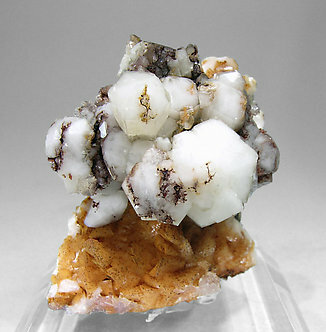 It is esthetically grown on a matrix covered by concretions of Calcite contrasting with white Tarnowitzite, a lead-rich variety, not very common, of Aragonite. 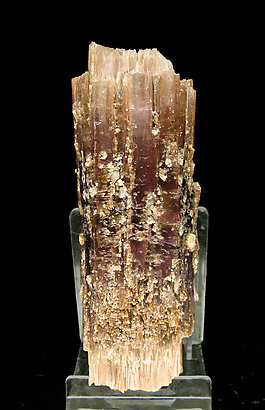 Very elongated prismatic crystals, a lot of them doubly terminated. 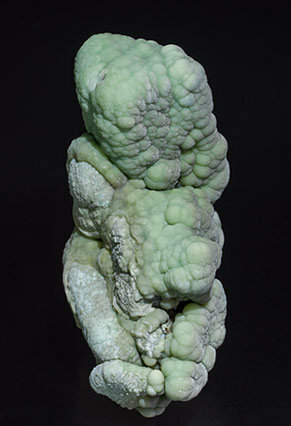 They have very well defined faces and edges, with a white color and are on matrix with small Smithsonite crystals. A classic of the most glorious Touissit epoch. 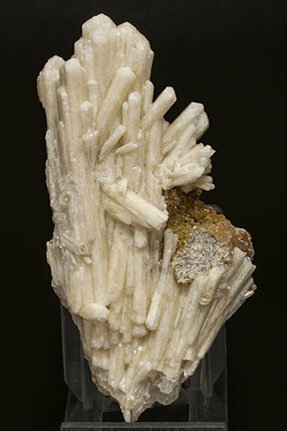 Group of cream-colored twinned crystals of this lead-bearing variety of Aragonite (6-7 % PbO in the samples from Morocco). 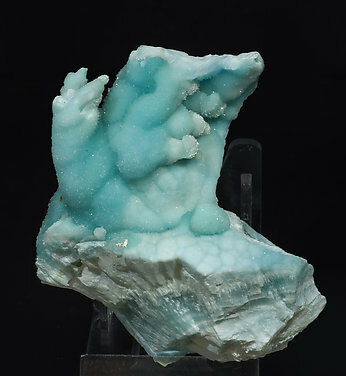 They have very well defined faces and edges and are on a matrix with small crystals of Smithsonite. Such samples, found around 1988, are actually very scarce. 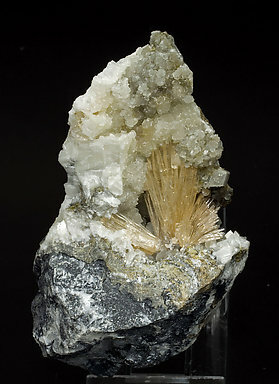 Radial sprays of very thin white, acicular crystals of Aragonite filling a cavity in Quartz with very bright black crystals, also acicular, of Goethite. A curiosity from Eugui. The groups of white acicular crystals are not individualized but they cover a group of perfectly defined rhombohedral crystals of Dolomite. 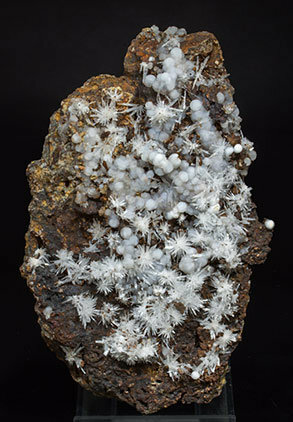 Radiating sprays, on matrix, of transparent colorless and very bright acicular Aragonite crystals with white spheroidal Calcite. As is the case with so many specimens in this collection, the sample is of great quality for the locality. Very esthetic specimen. 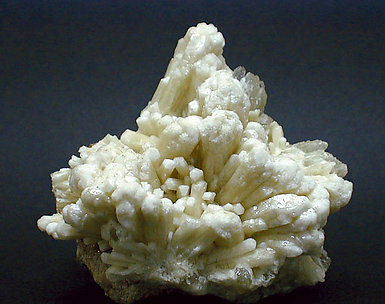 Acicular white to creamy color Aragonite crystals with curved edges. 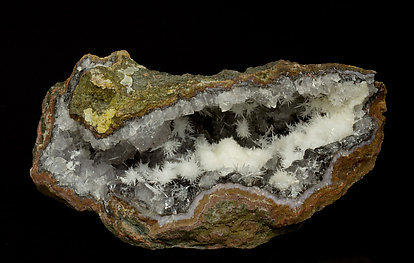 Crystals are forming a centered and divergent group over a rocky matrix covered with botryoidal Calcite. 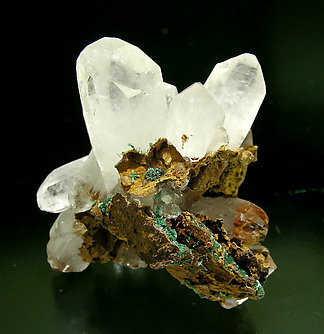 Centered aggregates of Aragonite, one of them clearly dominant, with slightly spindled acicular crystals , transparent, very bright and on matrix, with Quartz and Calcite. 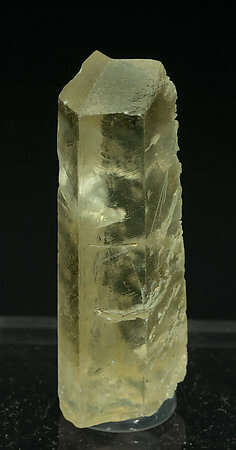 Very acute, almost acicular, crystals with very well defined faces and edges, transparent, bright and implanted on Dolomite crystals and on matrix. Crystals are different and of superior quality to those that are more common at Eugui. 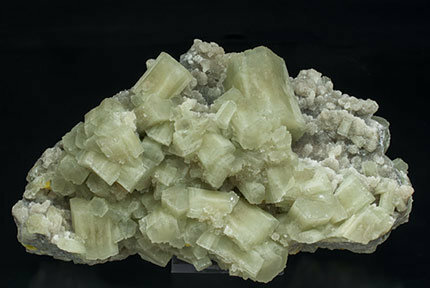 Aggregate of twinned prismatic Aragonite crystals, some of them doubly terminated, translucent and with a white color, slightly greenish. 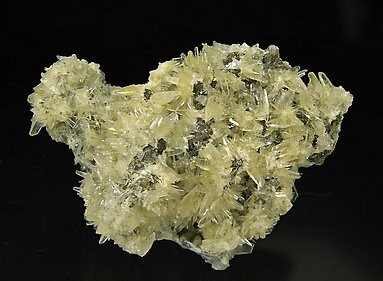 With small crystalline aggregates of native Sulfur with a very vivid color. The sample is from the Stoppani collection, whose label we’ll send to the buyer. As is the case with so many specimens in this collection, the sample is of great quality for the locality. 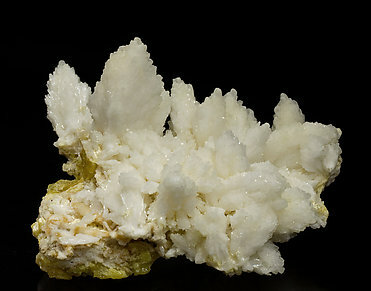 Bundled aggregates of very acute white crystals of Aragonite, bright and implanted on a matrix of native Sulfur. A Sicilian classic. 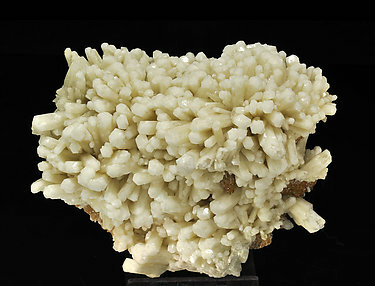 Botryoidal aggregate, on matrix, of cuprian Aragonite. It has a uniform greenish color that in some areas of the sample tend to grayish tones. The sample has been analyzed and we’ll send a copy of the analysis to the buyer. 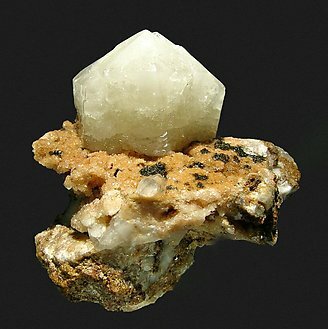 This specimen has been published on the Mineralogical Record´s web page, in the ‘What’s New in the Mineral World?’ section, report #40, April 21, 2015 edition. 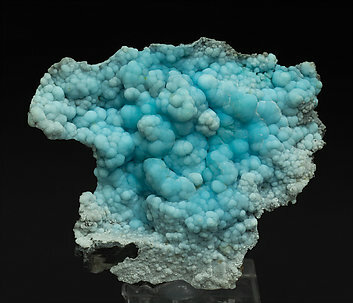 Fine botryoidal aggregate, on matrix, of cuprian Aragonite, with a uniform sky blue color on most of the sample, partially bordered by white smaller forms of the same Aragonite.